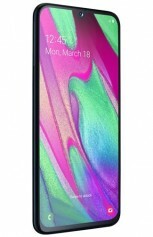 Earlier today we saw leaked press renders of the Samsung Galaxy A40, but now the phone is official in the Netherlands. It arrives with Exynos 7885 chipset, dual main camera, 25 MP selfie shooter, and OneUI. The Galaxy A40 sits between the Galaxy A50, and the Galaxy A30. It has a 5.9” Super AMOLED panel with Full HD+ resolution and a notch on top that Samsung wants you to call “Infinity-U display.” On the inside, the chipset is coupled with 4 GB RAM and 64 GB storage, and there is a microSD slot for up to 512 GB more. The dual camera is 16 MP + 5 MP, with regular and ultra-wide sensors, just like the Galaxy A30. The front-facing snapper is the same as the Galaxy A50 with its 25 MP sensor and f/2.0 aperture. 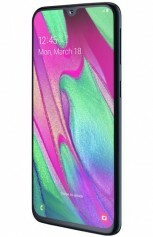 The price of the relatively small (144.3 x 69.1 x 7.9 mm) Samsung Galaxy A40 is €249, and it comes in four colors - Black, Blue, Coral, and White. For this price you also get a 3,100 mAh battery, Android Pie with OneUI on top, and a fingerprint scanner on the back. The Dutch retailer Belsimpel is already gathering pre-orders, with an official launch scheduled for April 10.